We are saddened to report that the rare Kemps Ridley turtle which washed up on the Welsh Coast last week, has lost the fight for her life. Despite the best efforts of our rehabilitation team assisted by vets and turtle experts, the turtle was incredibly unwell. We knew from the start this turtle was in bad shape and was going to face some serious challenges in its rehabilitation, but we hope that the valuable experience of the past 12 days and knowledge gained from working with this turtle will enable us and others to help future stranded sea turtles. Thanks for everyone’s support during this time. You can find advice on what to do if you find a stranded sea turtle on a beach this winter at the very bottom of this page. 24/12/15 update – she’s made target temperature! • Christmas has come early for us today as our rescued sea turtle has reached her target temperature of 25c. She came to us at 14c on the 14th December so we are very pleased with this improvement. • She is still getting used to the protein shakes three times a day (50% squid and krill puree and 50% electrolyte solution). • We offer her a solid piece of squid at each feed but so far she has no interest in it. • Her activity has improved and we are happy to report lots of toilet moments! This is a good sign that her digestion is improving. • Aquarists have noticed she is now so much stronger when trying to tube feed her. It won’t be long now until we can no longer hold her whilst she feeds and she will be on solids. • She continues to fight her septicaemia infection with antibiotic support. • The team popped her in a larger water tub today to see how she reacted. There was much flapping and splashing and she was actively trying to swim under water but she was very tired after this burst of activity. • Her buoyancy is not great at the moment so after Christmas we are commencing with daily water physiotherapy sessions to allow her to practice swimming again and generally build her strength up. • The first protein shake was successfully fed to her this morning and was a puree made up of 50% squid and krill mix and 50% electrolyte solution. It went down well! • The Aquarist team are witnessing more activity as she is now nearing her usual core temperature. • We have a second vet visit from Michael Parry scheduled tomorrow. 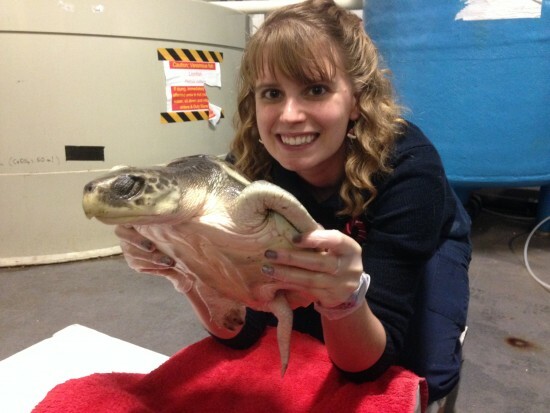 Kemp’s ridley sea turtle rehabilitation – It’s a girl! 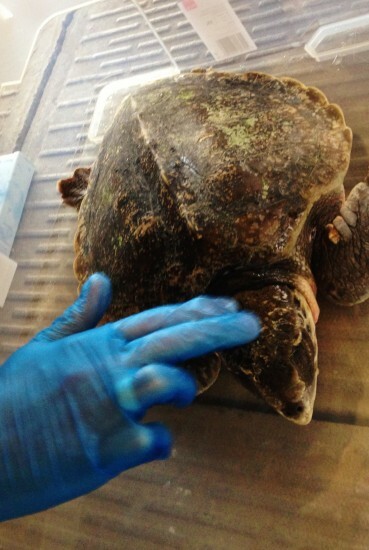 • Our group zoo vet has visited us today and is encouraged by the sea turtle’s response to treatment so far. 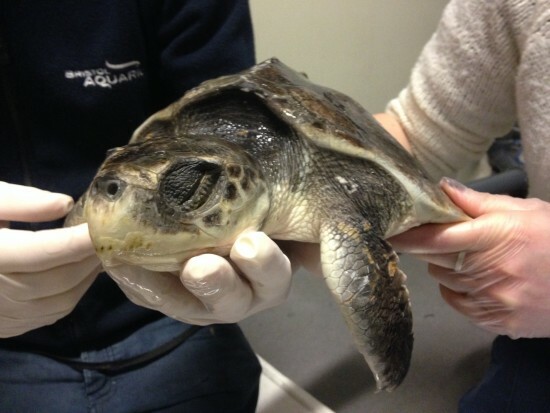 – The zoo vet also confirmed the juvenile Kemp’s ridley is very likely to be a girl. While it is still quite hard to tell before turtles reach maturity, this is fantastic news for the team here. It makes the conservation efforts taking place even more poignant. 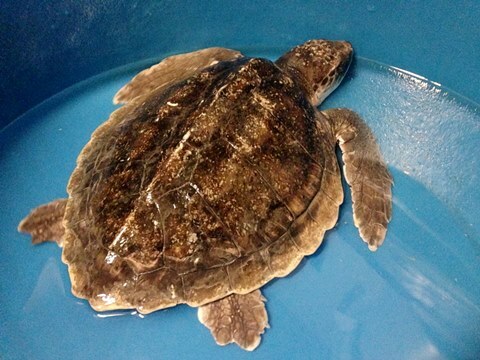 • The Bristol Aquarium aquarist team who are administering treatment have witnessed a bit more activity today, but the sea turtle’s condition is much the same since it arrived here on 14/12/15. – We are bringing up its core temperature very slowly. It is suffering from hypothermia, also known as “cold-shock”, after being stranded 6,000 miles away from the warm Gulf of Mexico waters it usually lives in. – We have to continue with rehydration. This is done by tube feeds of an electrolyte solution (packed full of essential salts, minerals and nutrients) three times a day. Only when its core temperature reaches 21c-22c, can we start to feed it pureed protein. If we try and feed her protein too soon before she is up to a good temperature then she will not be able to process the food. – She has a very strong jaw and sharp beak! Which makes tube feeding a very delicate challenge. A rare sea turtle is undergoing emergency treatment at Bristol Aquarium after being spotted by a dog washed up on a Welsh beach. The Kemp’s ridley is the world’s rarest marine turtle species and is officially classified as ‘critically endangered’ in the wild. The juvenile turtle, which measures around 30 cms in length, was discovered on Aberystwyth’s North Beach at the weekend. It’s thought the rare turtle may have been caught up in strong ocean currents as a result of Storm Desmond and carried in to UK waters. The turtle was initially cared for by the person who found it but it was then transferred on to Rod Penrose from Marine Environmental Monitoring who deals with turtle strandings. He contacted aquarists at the aquarium to see if they could look after it. Bristol Aquarium’s David Waines said: “We have been involved in more than a dozen sea turtle rescues to date and were only too happy to try and help. 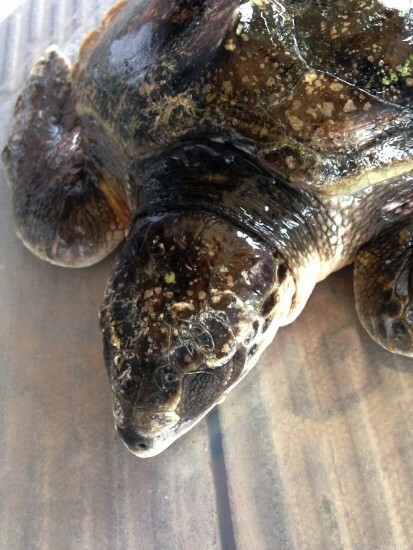 “Unfortunately this particular turtle is very poorly indeed and we are doing all we can, with the help of a vet who is an expert in marine turtles, to try and stabilize its condition. “Turtles only strand in UK waters when there is something seriously wrong with them. They tend to fall victim to our chilly waters and gradually become more and more lethargic until they lapse into unconsciousness. “The next few days are absolutely crucial but we have to face the fact that it has been through a lot and the fact it has stranded means it was no longer able to swim or fend for itself,” he added. Follow it’s progress on Bristol Aquarium’s Facebook page. Adult Kemp’s ridleys are restricted to the Gulf of Mexico but juveniles travel much further, occasionally ending up in British waters after journeys of approximately 6,000 miles. The nesting population of female Kemp’s ridleys was down to a few hundred nesting females laying approximately 700 nests in 1985. Since then, successful conservation efforts have led to better protection. The Kemp’s ridley population is slowly recovering and now approximately 10,000 nests are laid at Rancho Nuevo annually. Five of the seven species of sea turtle have been recorded from the UK coast including the leatherback, hawksbill, green, Kemp’s Ridley and loggerhead. However only the leatherback is capable of raising its body temperature to cope with the cold waters around the UK. The other four species are all hard-shelled and cold-blooded and will become lethargic if sea temperatures drop below 15 degrees C.
*These rules do not apply to leatherback turtles which can be carefully re-floated if uninjured. Please check with an expert first. Issued by Bristol Aquarium. For more information please contact David Waines, General Manager or Sarah Moore on 0117 929 8929.